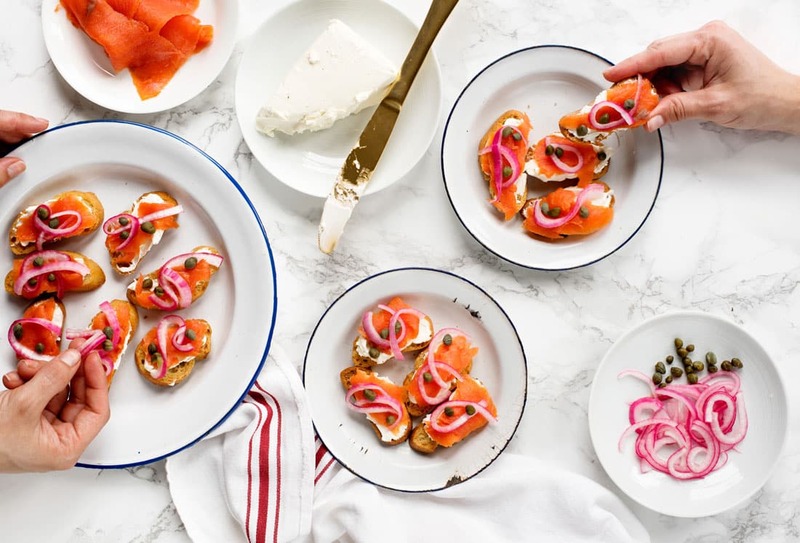 Lox & Bagel Cream Cheese Crostini are a fun spin on your favorite brunch food. They are easy to make, and they taste better than the original! Whipping up a batch for a backyard dinner party that Pat and I recently hosted was quite easy. You may not know it, but San Francisco’s best weather of the year happens in September! It’s the only time of year that we can be outside at night without being bundled up in a winter coat (and a scarf…and mittens). We wanted to celebrate a night of warm weather by gathering a few friends to eat outside. What I didn’t want to do was spend hours in the kitchen getting ready. After you have the crostini made, it literally only takes minutes to assemble the toppings for the crostini. The cool creaminess of the Philadelphia Cream Cheese in this recipe really balances out the smoked salmon nicely. There’s no substitute for the fresh milk and real cream in Philadelphia Cream Cheese, which is made with no preservatives. It adds the perfect flavor and richness for this fun and easy appetizer. And if you’re a long time reader of mine, you’ll notice that I use it all the time in both sweet and savory recipes! I always like to talk about what you can make ahead of time when you’re preparing for a party. You can pickle the red onions the night before and make the crostini the day before. Just make sure you bake the crostini until they are quite crisp and store them in an airtight container. 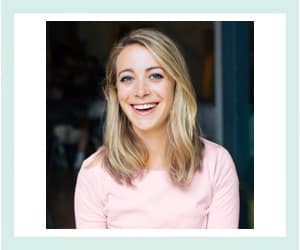 Thanks for reading A Side of Sweet! For more Sweet in your life, you can find me on Instagram, Pinterest, Facebook, YouTube, Bloglovin’, Snapchat (@asideofsweet), or Twitter. You can also subscribe to receive a weekly email with new posts and random musings from me. Peel and half onion, slice thinly. Place in a jar with a lid and fill with rice vinegar. Place in fridge for at least one hour, up to overnight. Make the Crostini: Slice bread into thin slices. One load will yield about 48 slices. Brush both sides with olive oil and season with salt and pepper. Place on a baking sheet and bake at 350 degrees Fahrenheit for 15-20 minutes, until golden. Let cool to room temperature. 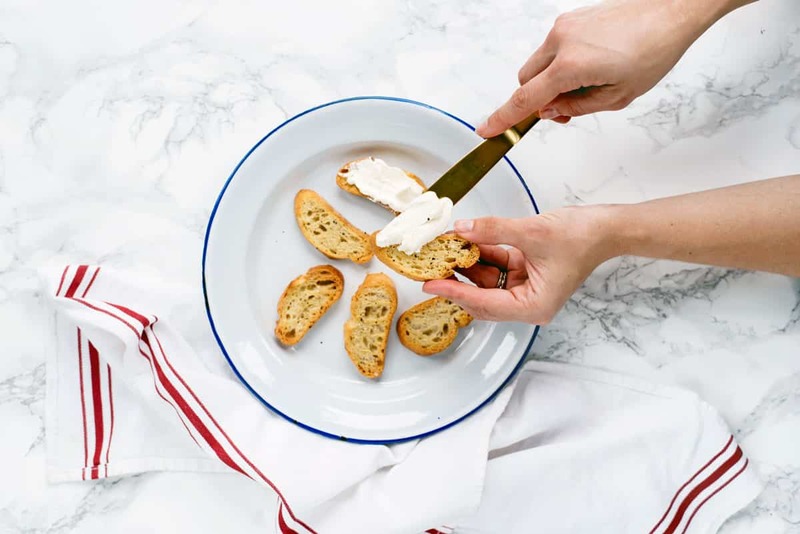 Spread cream cheese on each crostini. Top with smoked salmon, pickled red onions and capers. For the pickled onions: leaving the onions in vinegar for an hour makes them soft enough so that they stay nicely on the crostini but don’t have a strong pickled taste. Leaving them overnight will increase the pickled flavor and also make them a beautiful pink color. 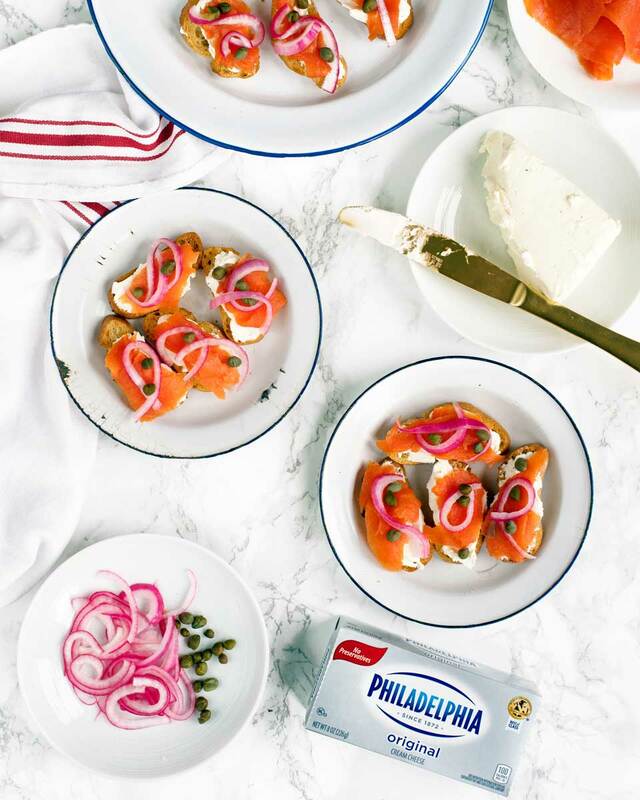 Turn to Philadelphia Cream Cheese for all of your entertaining needs. Always have it on hand to create appetizers and desserts that pop. 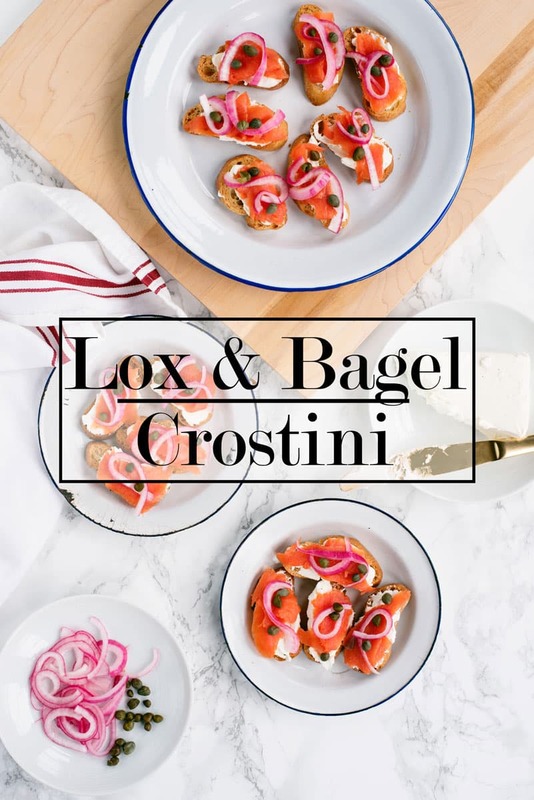 I had a great time developing these Lox & Bagel Cream Cheese Crostini for our backyard dinner party. Click here for more creamy, delicious recipe ideas. I’ve never had this type of combo before! But I know it’s a popular one! It absolutely is! You’ll have to try it! YUM! Seriously my one of my favorite meals. Keep an eye out for a shout out on my blog, ThePreppyMAG!